The presented 5-chamber KÖMMERLING 76 AD window profile is of excellent heat insulation parameters: value of coordinate of Uf heat permittivity equals in a standard option up to 1,1 W/m2K, while Uw for referential window equals up to 0,76 W/m2K. Special points of support in a KÖMMERLING 76 AD window profile make steel reinforcement always remain in the same position. Chambers of KÖMMERLING 76 AD window profile have been designed according to the latest technological solutions – influences better thermal and acoustic insulation and optimal stability of the structure together with high carrying capacity at the application of heavy window panes. KÖMMERLING 76 AD window profile has been designed in a manner that allows mounting of carrying elements of ferrule to go through many profile walls, which perfectly secures the places which are especially prone to loads. KÖMMERLING 76 AD window profile allows for tailored solutions in the range of selection of profile external surface coating – beginning with decor veneer of timber-like texture or plain colour and ending with innovative Alu Clip Pro aluminium overlay. KÖMMERLING 76 AD window profile is designed in a manner that allows for easy assembly of special anti-burglary ferrules and other additional security systems, such as rollers and shutters. Narrow and slender KÖMMERLING 76 window profiles allow for bigger surface of window panes. Additionally, the attractiveness of the system is also boosted by wide selection of decors of timber-like texture or plain and innovative aluminium overlay which may be anodized or powder coated. The system of KÖMMERLING window profiles with the application of special panes guarantees optimal protection against external noise. The latest seals mounted in KÖMMERLING 76 window profiles are the perfect protection against draft, dust and rain and make room climate cozy. KÖMMERLING 76 SYSTEM has the highest parameters of heat insulation. The innovation is the technology of thermo-insulation proEnergy Tec filling. High quality external surface of profiles in KÖMMERLING 76 system is very resistant to changing weather conditions, and its cleaning is simply easy. Optimal layout of steel reinforcement in KÖMMERLING 76 profiles of frame and leaf allow for perfect statics. 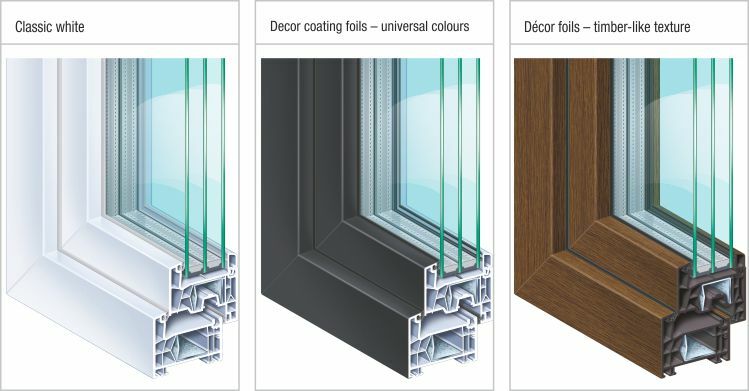 In the option of plied window pane, the three elements “leaf – glue –pane” make a unified and incredibly stable structure. The option with Alu Clip Pro aluminium overlay has its static features thanks to the said overlay. Nice climate indoors is possible thanks to KÖMMERLING 76 system which offers optimal program of ventilation systems. PVC KÖMMERLING profiles characterised by high quality and friendliness to health and ecology are produced in greenline eco-technology which guarantees long life and indirect influence on the higher value of the property. KÖMMERLING system of 76 mm-depth is attractive not only for newly-constructed properties but especially ideal for more challenging renovation works in terms of architecture and energy saving. Elegant window in white is still very popular. Plain, shiny surface of window profiles is easy to clean, resistant to weather conditions, durable and nicely looking. Available universal colours of décor foils are beautiful because of elegant and silky surface. They are nice to touch and easy to clean. Metallic colours look like brushed metal which is the result of exceptional metallic pigments inside. Timber-like foils may be selected for the external surface of the window – and neutral white colour inside – or timber-like foil both inside and outside the window. Thanks to that the window may be suited for the interior design or make windows almost invisible. All décor foils have exceptionally precious texture.